In 2017, I crossed the US-Mexico border on foot, as a pedestrian. The experience was so powerful, watching families cheer when US agents let them through, others promising they have the right papers, if only they can be let through this time. From outlet malls , parking lots, and sewage treatment on one side, to discount pharmacies, barefoot street vendors, and dim alleyways on the other. At pedestrian pace, I was exposed to the gradual, intricate changes in urbanism, culture, and atmosphere, over the course of only several miles of movement. How did this get defined, sifted into sides? How does such abrupt contrast come to be? Countries and cultures are instincitvely blended and co-dependent, co-influenced, in the digitally connected global space we seemingly cohabitate. In reality, the distinctions are apparent immediately, imposed by the brute deliberate separations on two sides of a political border. I have an ongoing project to document border conditions and transitional districts, thresholds, as thick as they may be. Lina won the ideas competition with Rhodesworks Design Studio, proposing a new context for the Resolute Arch. 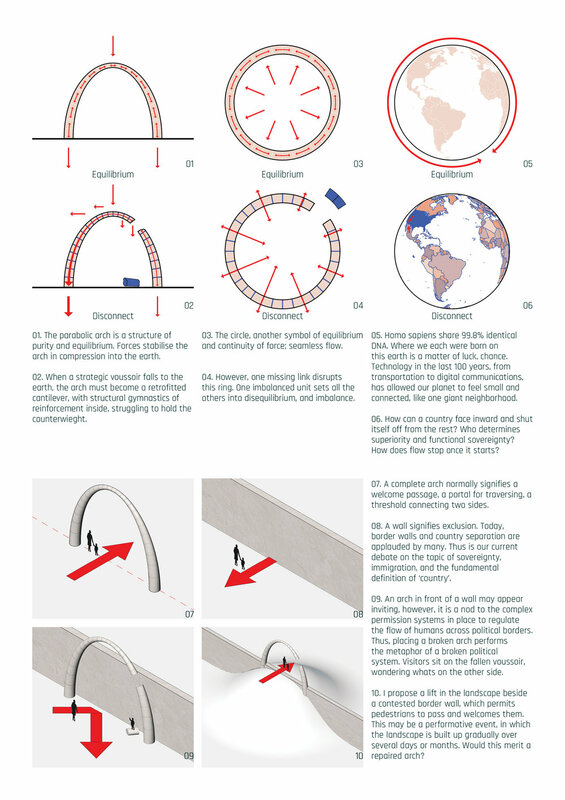 An arch and a border wall represent opposite positions of flow, yet are both architectural constructs which reinforce programmatic intentions, whether on a micro, residential scale, public recreational scale, or as a geopolitical, border system. In 2018, I joined Rhodesworks Sculpture Studio in Black Rock City, Nevada for construction of the arch during the Burning Man Festival. Now, picture it here, inviting a safe pedestrian passage through the threshold between two countries.